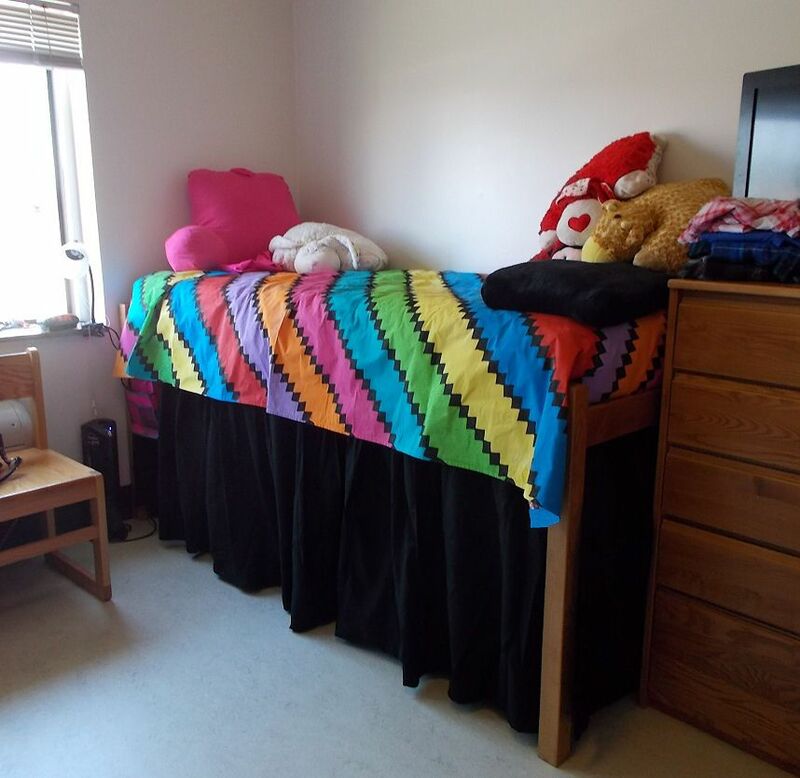 The bed cover shown here was designed by my daughter and her dorm mate for their first dorm room experience. The girls had known each other for years and both have been involved with 4H so creativity is not something new to these girls. As they designed their dorm room, neither one of them saw what is "available" at the store as a limitation to have the room they could create. For example, a store bought bed skirt is usually around 13" long. The girls wanted to be able to set the dorm beds at their highest setting so that they could use the space under the beds for storage. Since they both have allergy issues making dust is a problem, our ​custom bed skirts enclose all four sides of the bed to keep as much dust at bay as possible. Using sheets as the fabric was our most economical option to meet our fabric needs and have two matching skirts. By using three flat twin sheets from a box store the custom bed skirts cost under $15 each. Preshrinking the sheets before using them as a fabric is essential for not only shrinking but also to remove and chemicals that will stop the paint from making full contact with the fibers. These two girls have many things in common, including their first name but one of the places they differ is their favorite color and they actually dislike the color that is the other ones favorite so the decorating scheme became an exercise in compromise. Trying to find matching comforters that included both of their favorite colors turned out to be impossible. Our next step was to find comforters at a bargain price and then we would make duvet covers ... thinking that we would find a fabric with the colors we wanted, in a pattern they both approved... wrong...our next move became making our own fabric. Since the project took longer than we anticipated, the painted fabric became a bed cover and may sew them into duvet covers on their first vacation. Textile Medium is needed to transform acrylic paint into permanent, flexible and washable paint. Always follow the directions on the product you choose. For this project, along with the paint and medium described in the previous step, we also needed two sheets of stencil material, temporary basting spray to hold the stencil in place, paint pens (listed fabric use on the label), a drop cloth or large sheet of plastic to protect the work surface, a vanishing pen to mark lines, painters tape to mask off the lines and a small roller with the smallest nap you can find. A rotary ruler proved very handy for making the lines. Lay out the drop cloth or sheet of plastic on a surface large enough to protect your work surface. If you are using a sheet of plastic under a sheet, make sure the plastic is as large as the sheet as the paint bleeds through the plastic and will transfer to the back of the sheet if you attempt to just slide the sheet around on the plastic. The next step is to tape the lines. We found it easiest to tape inside every other line so that we could fully paint every other line. After the paint dried we re-taped so we could go back and paint the unpainted sections. Mix the paint and textile medium as directed on the package. Slowly and as evenly as possible roll out the paint to fill each section. Retouch as needed but keep the paint as even as possible to have a consistent color. The more paint you use, the greater the likelihood that the fabric will be stiff. After the first painted lines are dry, re-tape and paint the remaining lines. Once all of the lines were painted, I suggested that we sew a black ribbon on each intersection to divide the lines and to add the black color that the girls had chosen for their bed skirts. I learned they had a diamond design in mind and wanted diamonds on their bed coverings. SO we created stencils. We did attempt rolling the paint on over the stencil and we attempted pouncing to fill in the stencils but we all choose the paint pen as the best way to obtain sharp lines. We also covered the dining room table by taping garbage bags in place to have a hard work surface that we could sit down at to do all of the diamonds. Mark the design on the stencil material and cut out the design. Spray the back of the stencil with temporary basting spray and allow the spray to dray. You may have to re-spray the stencil as you work but repeat sparingly to prevent a buildup that is apt to come off on to the fabric, leaving a gummy mess. Apply the stencil where you want the design and apply pressure to adhere it to the fabric. Fill in the design with your chosen material. Repeat as needed to finish the design. Always follow the directions on the product you are using. For the bed cover we made, we were instructed to heat set the paint for 20 seconds using a press cloth. Doing an entire twin sheet making sure to press every area for 20 seconds is a time-consuming job but an important step to assure that the paint is set into the fabric and be permanent. While heat setting the two twin sheets, I covered our ironing board with unbleached muslin and used large pieces of unbleached muslin as a pressing cloth. As the fabric became "tainted" with colors from the paint, I replaced it. Allow the paint to dry for 24 hours or longer before heat setting the paint. Cover the ironing board and use a press cloth to protect the iron and ironing board. The press cloth also prevents the iron from smearing the paint, maintaining sharp lines. Allow the paint to cure for a couple of weeks or longer before laundering the painted fabric. Take your time and heat set the entire item... no matter how bored you may get! Make your Own Checkbook Cover!